The boys are doing a month of swim lessons on Saturdays. We requested this as a birthday gift from their grandparents. We switched locations, mostly because this place was 20 minutes closer. I feel like I spend so much time shuttling from place to place right now. Anywhere I can save time is a bonus. I was really impressed with the way the lessons are handled in the new location. Very efficient, more instructors, and a lot less time waiting along the wall for a turn. After the lessons are done, we are going to take a month off (due to some upcoming weekend obligations) but then do another month on after that. The boys don't want to leave when they're done - they enjoy it so much. This picture taken at the NC Zoo back in August. 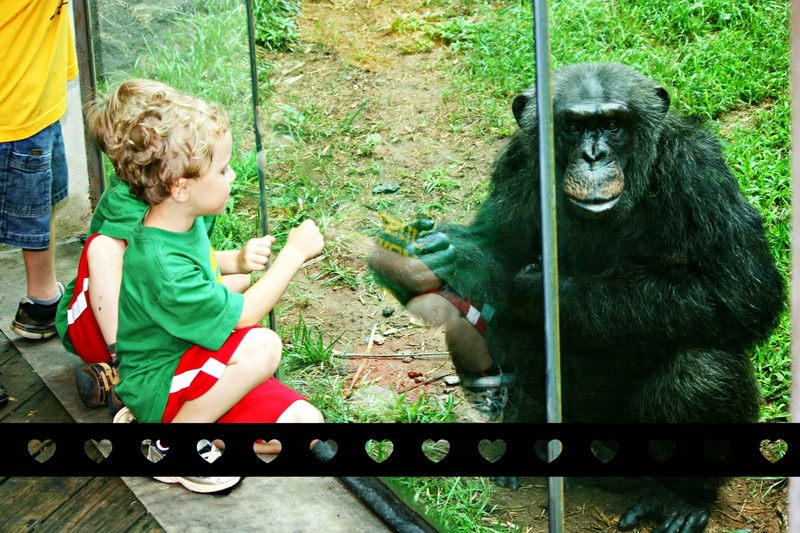 This chimp was giving the boys fist bumps through the glass. Readers, did you ever take swim lessons? I can remember as a kid when they threw pennies in the pool, and we had to dive to the bottom to get them. We got to keep any pennies we grabbed. That's all I remember from swim lessons! What an adorable picture!!! Swim lessons are a must for kids, and both Ella and Ann have had them and they both swim like a fish! Back in prehistoric times when I was a kid, kids did not take swim lessons. Polio fears for one thing. Wow Lisa, great blog! Thanks so much for visiting mine, and for your comment. I so enjoy reading visitor's comments! Don't we all, right? :) The swim lessons sound great, always a good idea for kids to learn. I don't have fond memories of lessons as a kid, I was afraid of the water and our instructor had no patience. She pulled me away from the side and left me to struggle where I couldn't touch bottom. I sputtered and coughed, and really don't remember whether I made it to the side or she finally helped me. I just remember having nightmares for a long, long time after that. It wasn't until high school that I finally learned to swim. I still can't dive worth beans, but I can swim enough to muddle through. Love, love the chimp!! They're so much smarter than we know. I'm glad your boys are learning how to swim and enjoy it. I took swimming lessons when I was little but didn't learn to swim. The lessons were in a private pool where the owner fave lessons. Not a lot of personal attention. But when I was in grad school, I started spending time in the pool to relax and taught myself to swim. I miss the water. I'll never forget my swim lessons because I was traumatized! I was only about 6. The instructor held my head under water and I thought I was going to drown. Never did enjoy swimming after that and I'm still afraid of the water! Fist Bumps from a Chimp? That's memorable . . .
My parents must have been old school - my dad litterally threww me in the water - and i swam . . before i could walk - HONEST! I've seen film footage. I learned to swim in the Marine Corps. I still shudder when I think about it. They are short on sympathy and long on results. I like Travis the Chimp. Even though he was gunned down by the police he certainly made his mark. La photo est superbe, pleine de symboles, aussi avec cet échange sympathique entre l'enfant et le grand singe. Le monde animal est mis en danger par l'homme. C'est en éduquant les enfants dans leur plus jeune âge qu'on les apprend à aimer les animaux, puis plus tard à les protéger. C'est ce que je pense. Avec toute mon amitié. I never got to take actual lessons. I think we just played in the lake with floaties on until we got brave enough to take them off. My kids had lessons though. We've had swimming lessons issues. Isaak was actually too good for his age. Instructors kept want to bump him up. Then the head lady said he wasn't old enough to bump up. I tried bumping him up, and he did fine. They wanted to bump him up more, and he was too slow in that one. Mica did ok, but he got lazy. We're on a break from swimming lessons. Too much pressure for the little boys and me. They just want to swim.